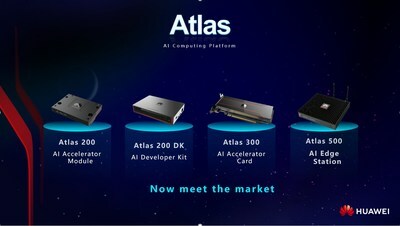 SHENZHEN, China, April 17, 2019 /PRNewswire/ -- During the Intelligent Computing Tour for China staged in Shenzhen, Huawei announced the official launch of the Atlas AI computing platform to the market, unlocking a new chapter on the Atlas commercial roadmap. The Huawei Atlas AI computing platform is powered by Huawei's Ascend series AI processors. Atlas offers various product form factors, such as accelerator modules, cards, AI edge stations, and appliances, providing an all-scenario AI infrastructure solution for the device-edge-cloud. It applies to fields of applications such as smart city, carriers, finance, Internet, and electric power. Integral to Huawei's full-stack, all-scenario AI solution, the Atlas AI computing platform unlocks supreme computing power to help customers embrace an AI-fueled future. Atlas 200 AI Accelerator Module: Packaged in a form factor half the size of a credit card, it supports 16-channel real-time HD video analytics and can be deployed on terminal devices such as cameras, robots, and drones. Atlas 200 DK AI Developer Kit: It helps developers set up the development environment in 30 minutes, and integrates a graphical programming environment to bring new levels of development efficiency. Thanks to the full-scenario capability of the Ascend processor, programs can be developed on the Atlas 200 DK AI Developer Kit in a one-off manner and deployed in device-edge-cloud scenarios with zero code modification. Atlas 300 AI Accelerator Card: It adopts a half-height half-length form factor and provides standard PCIe interfaces. It provides 64 TOPS of INT8 computing performance and supports 64-channel real-time HD video analytics with a 67 W power consumption. The Atlas 300 also boasts a 32 GB memory, which greatly improves the performance of video analytics and high-density inference. Atlas 500 AI Edge Station:Providing powerful performance, it can perform real-time data processing at the edge. A single device can provide 16 TOPS of INT8 processing capability with an ultra-low power consumption of less than 1 kWh per day. Built for complex natural environments at the edge, the Atlas 500 runs stably in harsh deployment conditions of -40 to +70 degree Celsius. During the launch, Hou Jinlong, President of Huawei Cloud & AI Products & Services, said that Huawei will deploy a three plus one intelligent computing industry strategy based on its five types of proprietary core chips for computing, network, storage, management, and AI. Huawei aims to address the computing requirements in the device-edge-cloud scenarios by leveraging three platforms: the x86, AI, and ARM computing platforms. The three platforms are the foundation for Huawei's full-stack, all-scenario AI solutions. Meanwhile, Huawei will build an intelligent computing ecosystem around the three platforms, working with partners to lay the cornerstones for customers' digital and intelligent transformation. "AI as a new general-purpose technology will become a new basic capability to change every industry and organization," said Ma Haixu, Director of the Huawei Intelligent Computing Business Department. "Huawei has always advocated providing inclusive AI that is affordable, effective, and reliable. As a vital part of Huawei's AI blueprint, the Atlas AI computing platform has been applied in smart city, carrier, finance, Internet, and electric power industries. Huawei has jointly innovated with partners to launch AI-facing best practices, empowering customers with high-performance, all-scenario industry solutions to embrace pervasive intelligence." Striving to bring pervasive intelligent computing with chip innovation, Huawei Intelligent Computing has built a full spectrum of products including the FusionServer Pro servers based on the intelligent management and acceleration engines, the Atlas AI computing platform and the Mobile Data Center (MDC) intelligent driving computing platform based on the Ascend AI processors, and the TaiShan servers based on the Kunpeng ARM processors. Tirelessly honing its core chips and product strength, Huawei is in a unique position to provide customers with superior computing power to meet diversified application requirements of various industries. Huawei is also constantly advancing cloud-edge collaboration and all-scenario deployment capabilities to build integrated solutions of ultimate simplicity and ease of use, catalyzing the intelligent transformation of industries. The Intelligent Computing Tour for China was joined by analysts, industry customers, and partners. Huawei introduced computing industry development trends, its intelligent computing strategy and initiatives, and the all-scenario AI computing platform. The event also offered an opportunity for the industry to share AI technology advancements and practices. Special guests included David T. Nguyen, a Ph.D., and a Director of Accenture Labs; and representatives from customers and partners. They shared AI technology trend insights, facial recognition and safe city development trends, as information on the use of AI in the logistics industry. The presentation vividly demonstrated the tangible benefits brought by AI technology. Huawei is a leading global provider of information and communications technology (ICT) infrastructure and smart devices. With integrated solutions across four key domains - telecom networks, IT, smart devices, and cloud services – we are committed to bringing digital to every person, home and organization for a fully connected, intelligent world.